In addition to deep medical expertise and acumen, Physicians today also require awareness and knowledge in areas such as practice administration, reputation management, data integrity risks and much more. NORCAL Mutual Insurance Company, which insures more than 17,000 physicians and health care professionals in California, acknowledges these changing trends in its newest policy. The new NORCAL Mutual Health Care Professionals (HCP) policy, now available in California, covers physicians for medical incidents, administrative liability and cyber liability risks, including cyber terrorism, cyber extortion, denial of service attacks and data recovery costs. 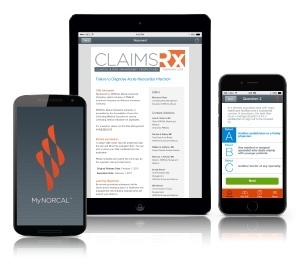 NORCAL Mutual Insurance Company, one of the top ten largest medical professional liability insurance companies in the nation, released a new mobile application – MyNORCAL™ – that will enable policyholders to conveniently access exclusive risk management claims-based learning and advice, take quizzes to earn continuing medical education (CME) credit and obtain certificates of completion on their mobile devices.